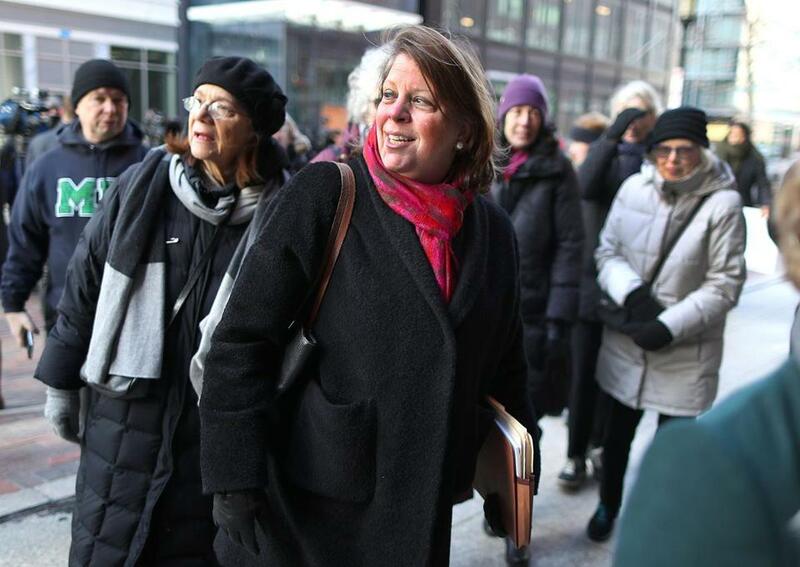 Carol Rose, executive director of the ACLU of Massachusetts, entered the Moakley Federal Court Friday morning. A federal judge in Seattle on Friday issued what he described as a nationwide ruling that temporarily blocked President Trump’s ban on travelers from seven Muslim-majority countries, as immigrants scrambled to enter the United States and lawyers fought over the executive order in Boston federal court and others. US District Judge James Robart in Seattle ruled that the states of Minnesota and Washington had standing to challenge Trump’s order and said the states showed their case was likely to succeed. Robart, in his written ruling, wrote that the executive order “adversely affects’’ residents across the two states and the state’s public universities. “These harms are significant and ongoing,’’ the ruling said. The White House vowed Friday night to fight the ruling, initially issuing a statement that called it an “outrageous order” and described Trump’s executive order “lawful and appropriate.” Seconds later, it issued an updated statement that dropped the description of the judge’s ruling as outrageous. The Seattle judge’s ruling followed a ruling in Boston federal court Friday that sided with the Trump administration — a further sign of the chaotic legal fights underway across the country. It appears to increase the odds that the fight over the order would end up before the Supreme Court. Trump and his aides have argued that the Jan. 27 executive order will make the country safer. It has sparked protests in Boston and around the country. In a victory for Trump, US District Judge Nathaniel M. Gorton in Massachusetts refused to extend a temporary stay on the president’s ban in Boston, saying Trump would likely succeed in the case on the grounds that he has broad authority over federal immigration laws. The Boston case appeared to be more narrowly drawn than the ruling in Seattle. The ACLU of Massachusetts and the American Immigration Lawyers Association’s New England chapter said late Friday that while they were disappointed in the Boston ruling, they believed the rulings in Seattle and a separate one in New York would continue to halt Trump’s travel ban nationwide. Trump’s order blocked visa holders from Iran, Iraq, Libya, Somalia, Sudan, Syria, and Yemen from the United States for 90 days, halted the entire refugee program for 120 days, and barred Syrian refugees indefinitely. Federal officials disclosed Friday that nearly 60,000 visas — and perhaps as many as 100,000 — were revoked as a result of the ban, which Massachusetts officials said thrust hundreds, if not thousands, of businesses and colleges into turmoil. Professors, scientists, and doctors who left the United States were shocked to discover that they could not return home. “While this Court is sympathetic to the difficult personal circumstances in which these plaintiffs find themselves, if they choose to leave the country, as nonresident aliens, they have no right to re-enter,” Gorton said in the 21-page ruling. The restraining order in Boston, issued in the middle of the night last weekend, expires early Sunday morning. The government’s lawyer made clear during the Boston hearing Friday that visa holders who live in the United States now may not be allowed to return if they leave the country. The Massachusetts judge’s swift ruling — just five hours after lawyers from the ACLU and state Attorney General Maura Healey’s office had argued in court that the ban discriminated against Muslims — marked a crushing defeat in a state that voted against Trump and rallied strongly against his Jan. 27 executive order. Governor Charlie Baker, a Republican, and immigrant advocates intensified their opposition Friday to Trump’s order, saying it affected companies and schools, including the University of Massachusetts, which has 300 students and 160 faculty and staff from the seven countries. In addition, the Massachusetts Senate had passed a resolution condemning Trump’s order, and the state’s entire congressional delegation, all Democrats, had opposed the ban. Lawyers said the restraining order cleared the way for several immigrants to return to the United States Friday to cheers and applause at Logan International Airport. But the celebration did not last. A lawyer for the Department of Justice defended Trump’s order in Boston federal court, saying the United States has broad powers over immigration laws and has the right to revoke visas. “They’re essentially reading this as a Muslim ban, because that’s what they want to see,” said Joshua Press, the Department of Justice lawyer who defended Trump’s order in court. He reiterated that nothing in Trump’s executive order explicitly banned Muslims, a point the ACLU challenged. When the judge asked if visa holders might be barred from reentry if they left the United States, Press said yes. Homeland Security issued a statement after the Boston ruling saying the order imposed a “90-day pause” on travel of citizens from the seven nations and reiterated it did not apply to green card holders, dual citizens, or people with diplomatic visas. 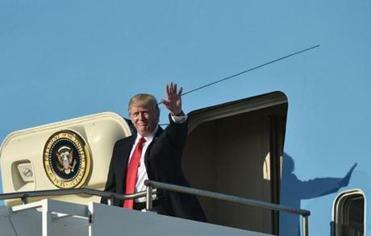 Officials said Trump’s order allowed the government over the next 30 days to review which nations are failing to provide adequate information about their citizens who travel to the United States. Then the nations will be given 60 days to provide that information. “Principally, the goal is to ensure that those admitted to this country do not bear hostile attitudes toward the United States and its founding principles,” the department said. The Boston lawsuit and restraining order were among the first legal challenges to Trump’s executive order, though other lawsuits have sprung up across the country. In addition to the ruling in Seattle Friday, a judge in New York agreed to extend a restraining order to Feb. 21, and a federal judge in Los Angeles imposed a restraining order against the travel ban. It was not immediately clear how the Seattle ruling would affect visa holders hoping to travel to Boston. Homeland Security officials declined to comment. Supporters of immigrants who returned to Logan on a Lufthansa flight from Germany Friday said some had left the United States for work or travel or to visit family only to discover that they could not return. On Friday, they were welcomed at Terminal E with signs, flowers, and applause, and US Representatives Joseph Kennedy Jr. and James McGovern. Banah Alhanfy, a citizen of Iraq, was the first passenger from a banned nation to arrive Friday, shortly before 2 p.m. She fell into arms of family members waiting in Boston. Her uncle, Aqeel Mohialdeen of Maine, hugged her tightly, tears in his eyes. “After the executive order, the whole family didn’t know what to do,” he said. Alhanfy said her visa had been issued later than those of her relatives and that they had arrived in the United States ahead of her. She had been barred from her original flight in Iraq due to the travel ban, but said she changed her destination to Turkey and traveled to Germany, where she boarded a Boston-bound flight. Partopour, who was also on the Lufthansa flight, met the media wearing a blue blazer and carrying a champagne-colored rose. “I’ve lived in Worcester more than two years. It is my second home,” Partopour said. Also returning Friday was Niki Mossafer Rahmati, an engineering student at MIT who had spent winter break in her native Iran. “We can all be glad that our affected undergraduates have overcome their immediate immigration difficulties and are back with us,” MIT president L. Rafael Reif wrote Friday in an e-mail to the university community. 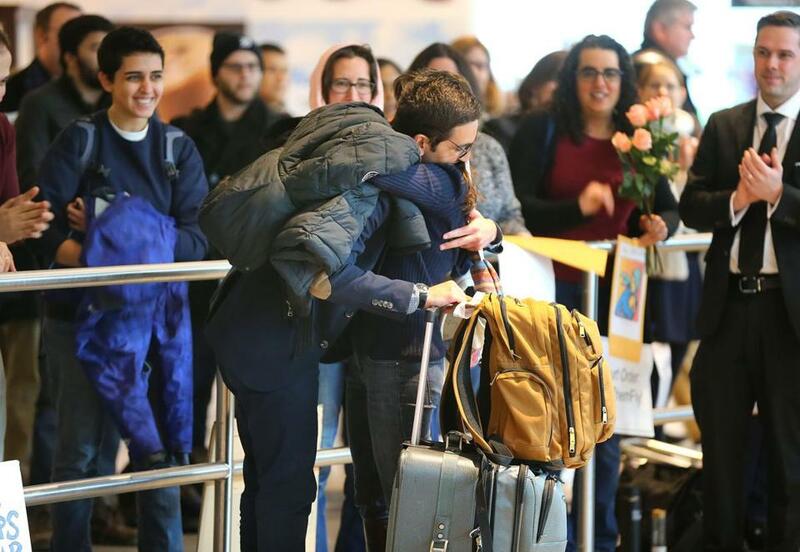 Behnam Partopour, a Worcester Polytechnic Institute student from Iran, was greeted at Logan Airport.